Connor Ronan and Ireland manager Stephen Kenny. 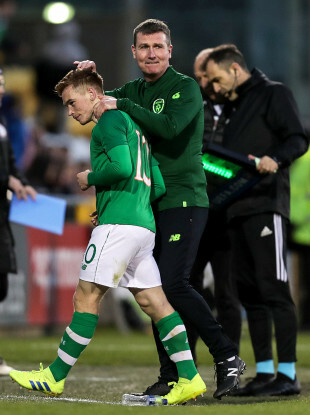 IRELAND U21S BOSS Stephen Kenny paid tribute to his side and in particular, Connor Ronan, who played a starring role in Sunday’s 3-0 victory over Luxembourg. In Kenny’s first competitive match as manager, the hosts were well worth the win at Tallaght Stadium as they kicked off their Euro 2021 campaign in positive fashion. Ronan was named man of the match, having produced an influential performance, with assists for two of the three goals. The 21-year-old, who was born in Rochdale and initially represented England at underage level before opting to switch to Ireland, was a constant thorn in the visitors’ side, operating in the number 10 role. Kenny believes Ronan is benefiting from some encouraging recent form at club level and the starlet has long been considered a player of immense potential. An technically accomplished midfielder, Ronan made his full Championship debut aged 18 for Wolves over two years ago and featured in their FA Cup triumph against Liverpool during the 2016-17 campaign. Since then, however, Ronan’s progress has not been as swift as he might have hoped. Despite seven Championship appearances for the Molineux outfit, he has yet to fully establish himself in the first team, with the club’s ascension to the Premier League coinciding with the Irish player’s fall down the pecking order. Last season, the youngster played 16 times on loan at League One side Portsmouth. Another loan switch this season to League One strugglers Walsall ended, after 11 appearances, in December. Ronan then decided to make another loan move in January, this time to the left-of-field destination of Slovakia, linking up with top-flight club Dunajská Streda, who are currently third in the table, 16 points behind Slovan Bratislava. “Everybody’s had kicks in the teeth in football,” Kenny said of Ronan, after Ireland’s 3-0 win. “Very few people have had just upward curves in their career. Connor had a spell on loan down the leagues in England and it hasn’t gone well for him and he’s gone to Slovakia. Kenny also praised his side’s overall performance as they went top of the group, albeit due to the fact that no other matches have been played yet. The caveat, of course, is that Luxembourg looked a poor side, creating no clear-cut chances, with Caoimhin Kelleher a virtual bystander in the Irish goal. Nevertheless, Kenny feels their opponents are a better team than some might have assumed on the basis of Sunday’s performance. Email “'You have to have guts about you to go to Slovakia' - Stephen Kenny pays tribute to Ireland's MOTM”. Feedback on “'You have to have guts about you to go to Slovakia' - Stephen Kenny pays tribute to Ireland's MOTM”.